(GREEK NEWS AGENDA) The 27 members of the European Union have agreed that the time is ripe for the EU to inaugurate a new framework of cooperation with its Eastern Partners, engaging in dialogue with 6 countries: Armenia, Azerbaijan, Georgia, Moldova, Ukraine and Belarus. 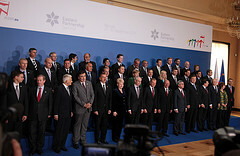 On May 7, the Czech presidency held the Prague Summit, which officially launched the “Eastern Partnership,” with the participation of EU’s 27 members and representatives from the 6 countries. 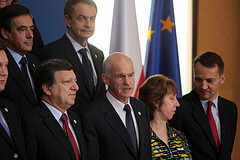 Greek Prime Minister Kostas Karamanlis addressed the inaugural session of the Eastern Partnership Summit, emphasising the importance of energy interdependence between the European Union and its partners in Eastern Europe, noting that energy security must be safeguarded at all times by all EU members, regardless of their level of dependence and that this constitutes a perception that needs to be endorsed widely by all Europeans. Lastly, Karamanlis stressed that the importance of the EU’s strategy for the Eastern Partnership Summit lies in the possibilities that the strategy provides for strengthening regional stability. Greece supports the economic and social development of the 6 countries without this being associated to accession to the EU. In particular, Greece’s chairmanship at the OSCE is already in cooperation with all six EU’s Eastern Partners within the Organisation’s structure. Moreover, pledging to deliver tangible results in troubled region such as Georgia, the Greek chairmanship has assumed the responsibility to act as a broker to promote peaceful settlement of conflicts.